Artist Corre Alice finds her niche in a funky Cumberland heritage building bursting with character. The bright teal and purple building with the words Frelone’s Grocery is hard to miss when you drive up Cumberland’s main drag. The building at the corner of 5th and Dunsmuir has stood since 1935. Though it’s always sported the grocery store description near its roofline, the building has housed many types of businesses throughout its existence—in addition to a grocery it’s been an accountant’s office, a motorcycle shop, a health food store, and even a movie theatre. The changes have continued, and for now it’s an art studio owned by Corre Alice. But it’s more than just a studio—this is Alice’s dream. 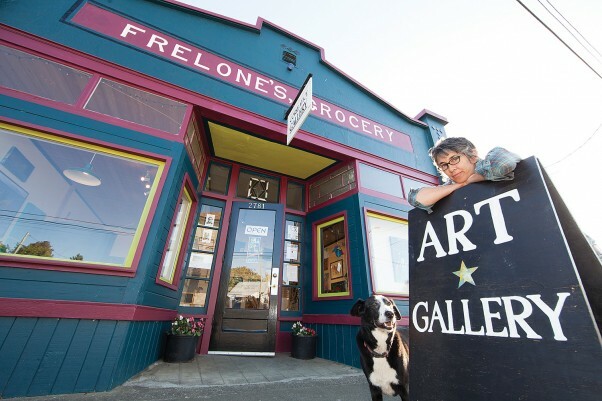 Though the Frelone’s Grocery building has changed throughout the years, Alice herself has remained constant—she’s always been an artist. As far back as she can recall, Alice remembers drawing and creating art. “My bedroom walls were literally papered with my abstract water-color drawings,” she remembers. Alice has found consistency in her desire to create art, but she hasn’t always lived in the same place. She was born in the Lower Mainland, but when she was a young girl she moved to Vancouver Island. Later, as a young adult, she lived on a boat in the Gulf Islands and a few years later she moved to Maine and New Hampshire where she stayed for six years. However, the West Coast eventually called her back home, and soon she returned to live on Pender Island where she raised her three sons and even built a straw bale house. Pender Island is where she stayed for 20 years until she eventually felt the need to move on. “It seemed like I needed to experience more,” Alice says. Though it was difficult to leave her friends and her family, she decided to leave Pender and move to Victoria where she purchased a condo. The Chinatown loft was a great space for a studio but there wasn’t much area left for living. “I had room on the floor for a foamy, but that was about it,” she says with a laugh. “But I’ve never felt like I needed to live in a big conventional house. I’ve always preferred studio space over living space.” The Chinatown loft was closer to her style than the condo, but it was still far from perfect. She soon realized that the first step toward finding the ideal spot for her was to actually decide exactly what that perfect place looked like. So she decided to write down the parameters that described her ideal living and working environment. She imagined a location where there was studio space full of sunlight. The gallery needed to be toward the front and on a well-traveled road. 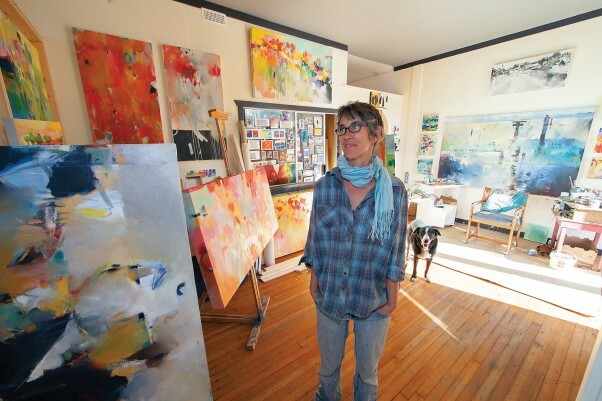 There also needed to be plenty of room for her to work—a studio awash in natural light and close to the gallery. It needed enough area toward the back that she could convert to a living area. And lastly—though it seemed too much to ask—a garden area would make it absolute perfection. As far as location was concerned, anywhere was fair game. However, Alice had recently discovered Cumberland and was taken by the energy she felt in the small village. She wrote the words ‘Maybe in Cumberland’ on the side of the notebook page that described her dream locale, but continued to look all over Vancouver Island and the Kootenays. One day she heard that an older building on the Cumberland main street was up for sale. She had no idea what she’d find, but with cautious optimism Alice rushed to Cumberland to take a look. The building was quite old and would need changes, but Alice could see that with alterations it might be just what she was looking for. Within hours of looking at the building, she made the decision to try and purchase the space. There was a wrench in the works, however—someone else had already placed an offer on the building. But Alice was not to be deterred. She strongly believed the old Frelone’s Grocery building was meant for her, so she decided to practice what she described as positive affirmations. She had a friend take a picture of her standing at the door to the building, key in one hand and the other hand on the doorknob. She printed the photo, wrote the words ‘My New Life’ across the top of the picture in big bold letters, and hung it in a spot where she’d see it throughout the day. At the time the photo was taken the building was being rented out as a movie theatre. Alice remembers when one day she looked closely at the photo and noticed a movie poster in the window of the building. Behind her and in plain view is a movie poster advertising the old children’s film “Alice in Wonderland.” It gave her goose bumps, but she took it as another sign that this spot was positively meant for her. In time her persistence and positive thoughts paid off, as the other deal fell through and the owner accepted her offer—the old Frelone’s Grocery was now hers. However, buying the building was just the beginning, as there was an incredible amount of work to be done to make the building into a workable studio and a liveable space. Fortunately, Alice has worked in construction in the past so she’s quite capable with manual labor. When walls needed to be added, she added them. When she needed a new back porch, she built it. And when she realized she needed a better heat source she installed a woodstove and a hearth. Though she did most of the work herself, there were times when she would have welcomed some assistance—and oftentimes, help came just when she needed it. The building that once housed Frelone’s Grocery in Cumberland is now home to Corre Alice and her dog, Famous. Over the years the heritage buiilding has been home to an accountant, a bike shop and a movie theatre. Three months after she purchased the building, Alice’s complicated and energetic pieces were hung from the walls and were visible in the windows. Soon paintings of Cumberland were also on display. Cumberland’s alleyways in particular, as well as the beautiful trees and old homes, are subjects Alice finds fascinating to paint. Her muted style is perfect for capturing the eccentricities of the village she now calls home. Because Alice appreciates the art of others, she maintains a large portion of the gallery that can be rented out by artists to showcase their work. Artists of varying mediums book the space months in advance. The rotating work by different artists lends the gallery an eclectic and dynamic air that is popular with village residents. In the future, she hopes to turn the gallery into what she describes as an art collective, where two other artists can use half of the gallery as their own personal studio. “I just love the energy that is created when artists share a space,” she says. Though she’s only been in Cumberland two years, Alice and her gallery have become an important and cherished part of the community. People wander into her gallery to see the art, to give her dog Famous a pat, and to chat with her and maybe share a cup of tea. The vibrant building is even more colorful as she’s added a mural to the fence adjacent to the building. She has other murals in the works. The Corre Alice Gallery is located at 2781 Dunsmuir in Cumberland and is open most of day from Tuesdays through Saturdays. For more information call 250-400-4099 or visit her website: www.correalice.com. What a great little story to read. I live in Cumberland and I am always curios to know how others end up here. I was really impressed by Corre’s strength and determination, wow what an inspiration. I love the part about the picture of Corre with the key to the building and the “Alice in Wonderland” poster in the background…so cool that her dream became a reality!